This is kind of silly, but maybe not, I don't know, I guess I should just say it...I really love Instagram. Yep, there it is. And it's very true. More and more as I use this social network I become more smitten. I love how people all over the country – the world – can come together and inspire each other through this little lens of their life. I know it can become sort of fake, but isn't that a battle we'll always be fighting. Like makeup and small-talk, there's always a facet of truth that we're nothing fully experiencing in our relationships. 100% sincerity is usually something only encountered in your marriage and best friendships; and even that can be a challenge. Sometimes it's even hard to be that honest with yourself. Anyway, my point in all this borderline "deep" banter, is to say that I think it's okay to have a space where you can post only your best and most favorite pictures. A space where people experience only the most gorgeous spots (on the most gorgeous days) where you live. A peek into the corners of your home that you've managed to keep neat and organized. I don't think that's wrong. Lately when I look through my intsa feed I feel inspired and I LOVE that. I need to be inspired. It keeps me excited. It gets me going. And inspiration for me looks like golden hour at the Embarcadero, a successful fritatta on my pretty little table, moving my chalkboard to the other room to get the perfect light, a cabin home I wished I lived in, and my feet in the leaves because, like everyone else, I think it makes a great picture. 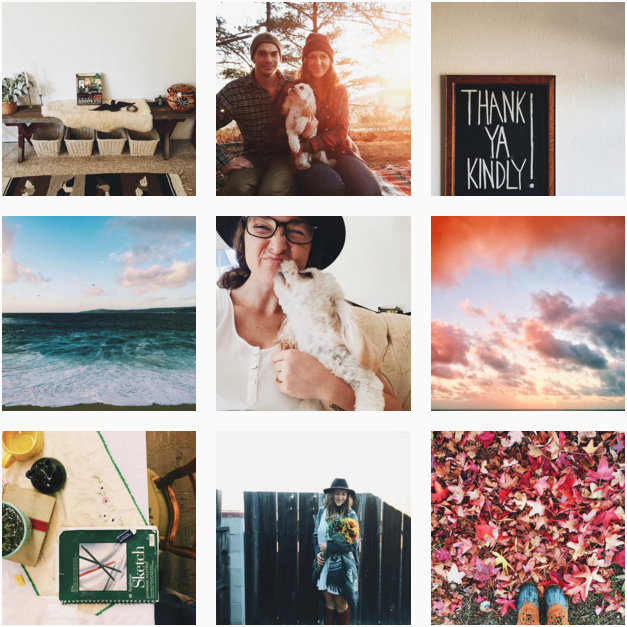 There are many Instagram accounts I follow purely because I think their lives are absolutely beautiful, and sometimes I wish mine looked the same – that's the part you have to be careful of. Being authentic. Showing your true colors in a way that you can enjoy. I've really loved expressing myself through my captions. Ex: "My home's a mess and the last thing I want to do is pick up another slobbery dog toy. Oh well, at least my table still looks pretty." attached with a beautiful photo of my wood table and woven placemats. OR "Today I sat at home and did nothing, so here's a picture from last month when we drove up to Big Sur and watched the sunset. " alongside a glowing photo of the coast at sundown. BASICALLY, be yourself. Delete that photo from a while back that never quite fit in your feed, only post pictures with a white background if that's what makes you swoon, hashstag vsco to get more followers. I don't care. Just have fun. End rant.